Life has been full of doing other things besides hiking or outdoor adventuring lately. Mostly we’ve been working on projects around the house. Recently we started working on renovating the laundry room. I hated the floor, the walls were crap, and there was no hot water running to the washing machine. Now there’s hot water, 3/4 of a new floor, the wall painted with touchups needed, and a few other items to do such as install cabinets. We’re waiting on the cabinets to come into the store we ordered them from so that we can finish the painting and the flooring. 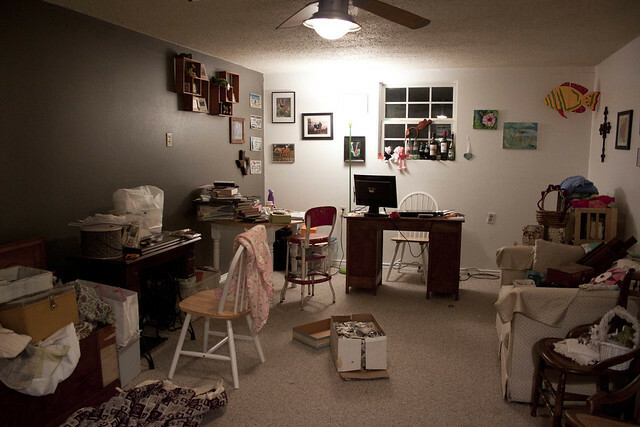 But, the whole room already looks much better. 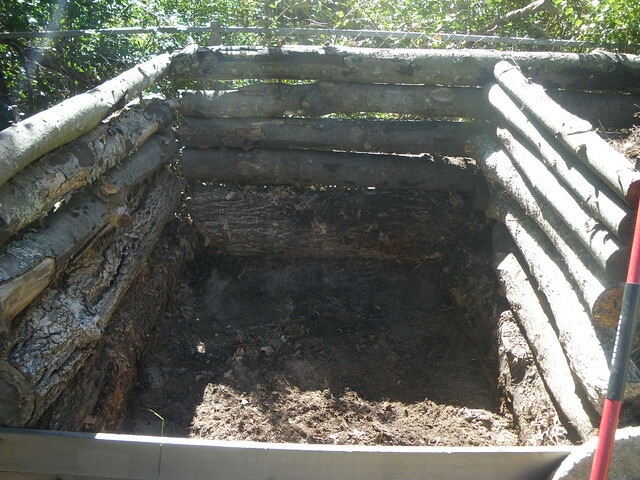 After almost a year of having compost on the left side of the compost bin, we finished it up yesterday. 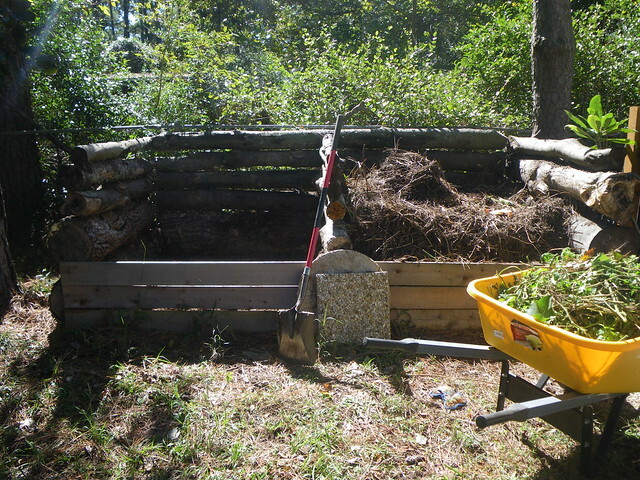 The bin is empty, the last bits going into the vegetable bed to ammend for late fall and winter vegetables. We’ll be eating greens until our skin is the shade of chard, kale, spinach, kohlrabi, and bok choi! I guess we will get to counter balance that with sweet potatoes we’ll dig up here in a few weeks, so maybe we won’t be a weird shade of green. Hah! 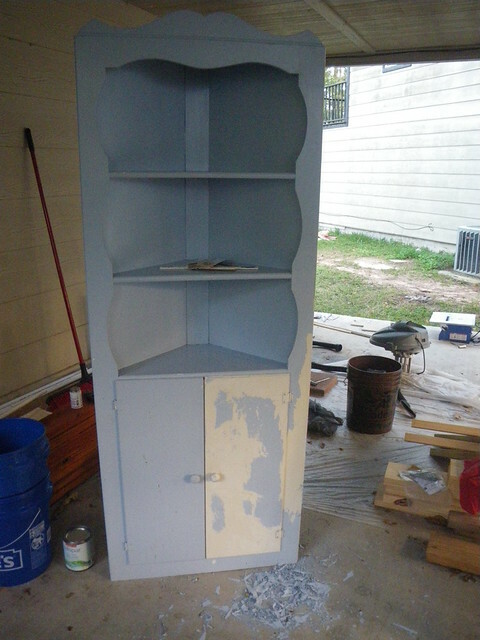 I started working on redoing this corner shelf that I’ll eventually put in my studio. The shelf had been at my grandmothers until my mom took it sometime in the 90s and painted it blue. It was then relegated to my parent’s garage until they asked if I wanted it. Ever the hoarder and memory keeper, I said yes. Taking the blue paint off is a real pain. I’m mostly now chipping it off with my fingernails and pulling it off in sheaths if I can. I’m bought a small can of ‘Sixteen Candles’ or maybe it was ‘Sweet Sixteen’ pink—it is girly girl pink, you get the picture—to paint the shelves and the doors and the rest will be white. I haven’t decided whether to put new door knobs on or just paint the old ones. Hobby Lobby had a bunch of sweet looking dresser knobs and I bought several to replace on another storage dresser I have in my studio that was missing some handles, so that is always an option if I decide to replace them on the cabinet too. Speaking of my studio, I rearranged it a bit again. I wasn’t feeling the writing jive where I was sitting so I moved the sewing machine from beneath the window and replaced it with my computer and writing desk. 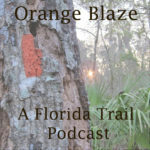 I also finally got around to hooking up my second screen and it is now so much easier to toggle back and forth from looking at the Florida Trail online map, my Flickr photos, and other internet resources, and then look at my Word document on the other screen. No, I’m not a new-school writer with a fancy writing application like Scrivener or some such thing. Eventually the corner shelf will go where the hanging fish is and I will have to relocate the fish elsewhere in the studio. As for writing, it is coming along. I managed about 5,000 words last week and am inching closer to be done. Currently I’m at the point where we have just entered St. Marks National Wildlife Refuge. My interest in writing has gone up some, mostly because the next bit of the trail was so interesting and different from the previous miles. I love that after an hour or two when I look back and see how much I’ve written or how many days I’ve written about, that the feeling is good. I can pat myself on the back for at least coming this far. Non-creatively I spent about three weeks getting through seasons 1-5 of Breaking Bad on Netflix. It took a few episodes to get used to all the murdering, but after awhile I started enjoying the show. Though, let me tell you, in season 5 I wanted someone to off Walt for his sheer idiocy. Now I’m just patiently waiting for the final season to come out on Netflix so I can figure out how it all ends. And that’s really about it. Aside from work, home improvement, gardening, and some creative endeavors, that’s what’s going on right now. We’re hoping for some long distance backpacking over Thanksgiving so I’m looking forward to that! That’s some great progress!! On all ends, but especially writing. Hope you continue to feel motivated by your book! I’ve just been painting and reviewing course materials from my intensive painting class, and “coming back down” from class being officially over. I still have about a week’s worth of lessons to get through so I’m still sort of in class. And then I’m trying to think ahead for the holidays and get as much done early as possible, because I actually want to ENJOY them this year, not just get through them. As far as house projects… Tom and my dad are doing a lot of post-summer cleanup around the exterior of the house. I’m trying to figure out how to make my art studio more workable now that painting is the main focus and it wasn’t really made for that! There’s paint all over, but I’m kind of okay with that. I’m also crocheting a bunch and watching BBC and BBC-America shows with Tom. We just finished Broadchurch, which was amazing, and now we’re working through Orphan Black, which is also amazing.